The Scottish referendum on independence has helped expose something we knew all along about what it is to have an opinion. Some of us are good at filtering out the evidence we would rather not see, and accepting only what supports our beliefs. I’m the opposite of a cybernat, but in this past intense few weeks, with so much at stake, and rising anxiety, I too censored my information streams. You can do it easily with online sources. Admittedly with reluctance, I de-friended at least one friend on Facebook to arrest the flow of links to news clips that kept reminding me of the inevitability and good sense of separation from the UK. 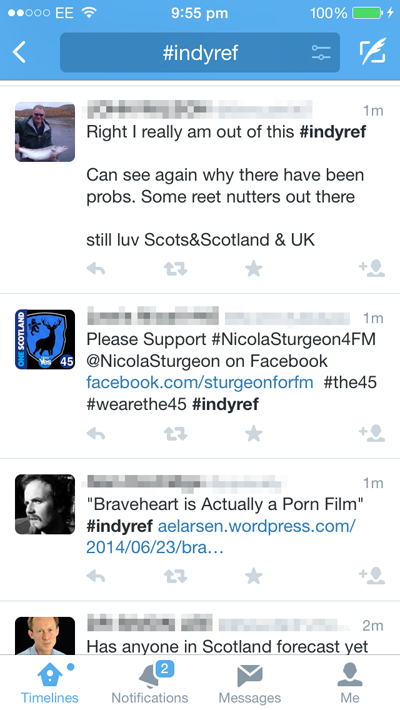 Fortunately I only discovered the tag #indyref on Twitter the day of the voting. I would have had to switch to a different hash tag to see the world as I wanted to see it. Lots of people have admitted to being persuaded by arguments for or against independence. But persuasion seems to depend on factors other than arguing around facts. Commentators have said you can divide the voters between those who went with their heads and those who listened to their hearts, i.e. those who submitted to logic (usually economic logic), and those who formed their opinions on the basis of how they felt. But just about everything I’ve been reading this past few years on emotion suggests this dichotomy is false. Logic doesn’t provide the best model for opinion formation. Neither does emotion. weapons to cast others into outer darkness. Emotion words are potent. Where one party thinks to point out risk and uncertainty the other side sees an attempt to sow fear, or at least either party chooses their emotion words to deliver the effect they want. We use words like risk, fear, certainty, freedom, hope, pride, and loyalty as tools to build and test a view of the world as we think we would like to see it. If we need to know how opinions are formed and circulated then we could do worse than consider the way language communities operate, on and offline. Also see blog post: Emotional words and Accentuate the negative. Perhaps social media users can regulate their moods by altering their Facebook news feeds after all. See post Emotional contagion. The first picture above is of the visitor centre (Gareth Hoskins Architects) on the site of the Battle of Culloden (1746) near Inverness. McFarland, K.T. 2014. Independence for Scotland? It’s my heart vs. my head. Fox News, (17 September) http://www.foxnews.com/opinion/2014/09/17/independence-for-scotland-it-my-heart-vs-my-head/. Rifkind, Hugo. 2014. Sad cybernats are brought crashing to earth. Times, (September 20) http://www.thetimes.co.uk/tto/opinion/columnists/article4212612.ece, 24. Scottish Referendum has considerably facilitated the tourism in Scotland to some extent even though it failed. I knew that as if it could succeed, it would have many years ago. Timing is crucial in any major civic transformation. Expressions of regional and national identity do help tourism I suspect. Everything has its 2 sides. Like Catalonia, refers this link: http://www.bbc.co.uk/news/world-europe-29390774, they never think they belong to Spain. Sometimes, this behaviour (Referendum) may be just a symbol of striving to become stronger, which doesn’t mean anything else. Anyway, trying is always brave I think, You will never know what will happen if you stop fighting. Some Chinese friends of mine just told me that the Scottish referendum is only a hype, the reason why they don’t believe the referendum might be that they don’t believe in the real democracy. I suppose it is the spirit of democracy that urge to remind and be shown toward the world by the Scottish campaign. Opinions also come from reporters’ cultural background. Actually there are different social media systems between British and China as people in PRC area cannot get connected into certain overseas network such as youtube or twitter, but it still cannot affect the timeliness of news reflected by China’s social media. Well, I would not say there any difference between the social media between GB and China, or any other countries. That is simply because the basic idea of these social networks are same, no matter in what forms or where (but yes, the political issues make difference, but I suppose this is not the difference of the SN itself).